Policies and procedures for compliance with ASTM and AASHTO regulatory codes and standards. Inspection forms w/checkpoints from CSI Divisions 31 and 32 - Earthwork and Exterior Improvements. Fully-written templates range in size between 30 pages and over 200 pages. And, are available for Civil/Industrial, FTA-DOT, FHWA, Caltrans or other government agencies' standards as well as ISO 9001 and ISNetworld requirements. 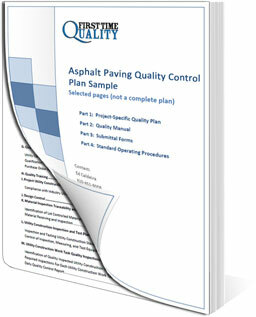 We'll assemble an asphalt paving quality control plan based on your contract specifications and personalize it with your company, project, and scopes of work information. See template personalization for more information. If you have very complex or non-standard requirements, we offer customization services. We can add additional writing or customize your plan when needed. See Pricing and Plans for more details.